Alex Michael Azar II (born June 17, 1967) is an American politician and businessman. He is the 24th and current United States Secretary of Health and Human Services since January 29, 2018. He was the United States Deputy Secretary of Health and Human Services under George W. Bush from 2005 to 2007. From 2012 to 2017, Azar was President of Eli Lilly and Company. He was a member of the board of directors of the Biotechnology Innovation Organization, a pharmaceutical lobby. On November 13, 2017, President Donald Trump nominated Azar to be the next United States Secretary of Health and Human Services. He was confirmed by the United States Senate on January 24, 2018. Azar was born in Johnstown, Pennsylvania. He was raised in Salisbury, Maryland. He studied at Dartmouth College and at Yale University. Azar was as a law clerk for Judge J. Michael Luttig of the United States Court of Appeals for the Fourth Circuit and then as a law clerk for Associate Justice Antonin Scalia of the Supreme Court of the United States from 1992 to 1993. From 1994 to 1996, he served as an Associate Independent Counsel for Kenneth W. Starr in the United States Office of the Independent Counsel. On August 3, 2001, Azar was confirmed to be the General Counsel of the United States Department of Health and Human Services. On July 22, 2005, Azar was confirmed as the United States Deputy Secretary of Health and Human Services. He was twice confirmed unanimously by the United States Senate. He worked under Secretary Mike Leavitt. Azar resigned in January 2007. On January 1, 2012, Azar became President of Lilly USA, LLC, the largest division of Eli Lilly and Company and was responsible for the company's entire operations in the United States. In January 2017, Azar resigned from Eli Lilly. 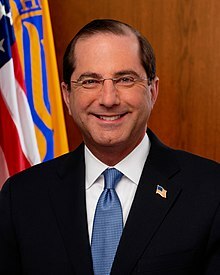 On November 13, 2017, President Trump announced via Twitter that Azar was his nominee to be the next United States Secretary of Health and Human Services. His nomination was confirmed by the United States Senate on January 24, 2018. He was sworn-in on January 29. Azar is married to Jennifer Azar. They have two children. They live in Indianapolis, Indiana. ↑ "PN430 - Nomination of Alex Azar II for Department of Health and Human Services, 109th Congress (2005-2006)". U.S. Congress. July 22, 2005. ↑ 2.0 2.1 "Trump Chooses Alex Azar for Health and Human Services Secretary". The New York Times. November 13, 2017. Retrieved November 13, 2017. ↑ "Alex Azar '91". Yale Law School. Retrieved August 10, 2017. ↑ 4.0 4.1 "Alex M. Azar II - Biography". World Congress. ↑ RISEN, JAMES (September 13, 1994). "Starr Names His First Whitewater Aides: Investigation: Independent counsel announces appointments to fill out prosecution team. He names a Fiske holdover as a top deputy". Los Angeles Times. ISSN 0458-3035. ↑ "PN492 - Nomination of Alex Azar II for Department of Health and Human Services, 107th Congress (2001-2002)". United States Congress. August 3, 2001. ↑ "PN430 - Nomination of Alex Azar II for Department of Health and Human Services, 109th Congress (2005-2006)". United States Congress. July 22, 2005. ↑ Mathis-Lilley, Ben (November 13, 2017). "Trump Health Secretary Nominee Left Job Overseeing Eli Lilly Investigation to Become Eli Lilly's Top Lobbyist". Slate. ↑ PRNewswire (October 11, 2011). "Lilly Announces Changes in Senior Management". Press release. https://www.prnewswire.com/news-releases/lilly-announces-changes-in-senior-management-131508298.html. ↑ PRNewswire (January 5, 2017). "Lilly to Adjust Organization and Leadership Structure to Better Align with Growth Opportunities". Press release. https://www.prnewswire.com/news-releases/lilly-to-adjust-organization-and-leadership-structure-to-better-align-with-growth-opportunities-300386251.html. ↑ "Alex Azar is Confirmed as Health and Human Services Secretary". The New York Times. January 24, 2018. Retrieved January 24, 2018.